Developments in Artificial Intelligence (AI) and Autonomous Systems (AS) offer various benefits that will revolutionise all aspects of society, ranging from search algorithms for online advertising (Goodfellow et al. 2016), signal processing (Karaboga et al. 2014), credit scoring (Tsai & Wu 2008; Brown & Mues 2012), medical diagnosis (Russell & Norvig 2016; Amato et al. 2013), autonomous vehicles (Fagnant & Kockelman 2015; Milakis et al. 2017; Taeihagh & Lim 2018), robotic medical assistants (Stahl and Coeckelbergh 2016) to autonomous weapon systems in warfare (Krishnan 2016). The rapid adoption of these technologies threaten to outpace the regulatory responses of governments around the world, which must grapple with the increasing magnitude and speed of these transformations. The societal benefits of AI and AS have been widely acknowledged (Buchanan 2005; Taeihagh & Lim 2018; Ramchurn et al. 2012), but these technologies introduce risks and unintended consequences. New risks include and are not limited to unemployment (Acemoglu & Restrepo 2018; Frey & Osborne 2017; Peters 2017; Osoba & Welser IV 2017), safety risks (Taeihagh & Lim 2018; Kalra & Paddock 2016), privacy risks (Russell et al. 2015; Lim & Taeihagh 2018; Litman 2017), liability risks (Marchant & Lindor 2012; Čerka et al. 2015; Taeihagh & Lim 2018) and inequality (Makridakis 2017; Acemoglu & Restrepo 2018), which require appropriate governance mechanisms to be mitigated. Traditional policy instruments may be ineffective due to insufficient information on industry developments, technological and regulatory uncertainties, coordination challenges between multiple regulatory bodies (Guihot et al. 2017), and the opacity of the underlying technology (Scherer 2016), which necessitate the use of more nuanced approaches to govern AI and AS. · What are the types of unintended consequences and risks that can arise from the adoption of AI and AS in different domains (e.g. ICT, transport, energy, public sector, healthcare, water management etc.) and how can they be effectively managed and governed? · How can AI and AS be responsibly deployed by public administrators? · What are the implications of AI and AS on incumbent industries and how can the relationship between these technologies and incumbent industries be reconciled? · Theoretical, conceptual and empirical approaches to understand new and unconventional regulatory approaches, governance strategies, institutions and discourses to govern risks arising from AI and AS. · What types of standards or guidelines have been developed in industry and governments to manage the risks arising from AI and AS? · How are risks arising from AI and AS allocated among different stakeholders vertically through the value chain (manufacturers, third-party service providers, consumers) and horizontally across different domains (transport, healthcare, financial sector, public agencies, ICT, education etc.)? · Single and comparative case studies of governance responses across different countries, regions and domains to address the risks arising from AI and AS. I hope you will join us for a stimulating set of presentations at ICPP4. A few papers from this conference panel will be considered along with the already selected papers for the special issue on governance of AI and Robotics to be published in the Policy and Society journal, the only fully open-access no-APC ISI-ranked policy journal. The special issue addresses these and other relevant aspects of governing AI including emerging governance approaches to AI, policy capacity building, as well as exploring legal and regulatory challenges of AI and Robotics. Acemoglu, D., & Restrepo, P. (2018). Artificial Intelligence, Automation and Work (No. w24196). National Bureau of Economic Research. Amato, F., López, A., Peña-Méndez, E. M., Vaňhara, P., Havel, J., Sánchez, C. L., ... & Dridi, I. (2013). 1. Artificial neural networks in medical diagnosis. Journal of Applied Biomedicine, 11(2), 47-113. Arkin, R. (2009). Governing lethal behaviour in autonomous robots. Chapman and Hall/CRC. Brown, I., & Mues, C. (2012). An experimental comparison of classification algorithms for imbalanced credit scoring data sets. Expert Systems with Applications, 39(3), 3446-3453. Buchanan, B. G. (2005). A (very) brief history of artificial intelligence. Ai Magazine, 26(4), 53. Čerka, P., Grigienė, J., & Sirbikytė, G. (2015). Liability for damages caused by artificial intelligence. Computer Law & Security Review, 31(3), 376-389. Fagnant, D. J., & Kockelman, K. (2015). Preparing a nation for autonomous vehicles: opportunities, barriers and policy recommendations. Transportation Research Part A: Policy and Practice, 77, 167-181. Goodfellow, I., Bengio, Y., Courville, A., & Bengio, Y. (2016). Deep learning (Vol. 1). Cambridge: MIT Press. Guihot, M., Matthew, A. F., & Suzor, N. P. (2017). Nudging Robots: Innovative Solutions to Regulate Artificial Intelligence. Vand. J. Ent. & Tech. L., 20, 385. Kalra, N., & Paddock, S. M. (2016). Driving to safety: How many miles of driving would it take to demonstrate autonomous vehicle reliability? Transportation Research Part A: Policy and Practice, 94, 182-193. Karaboga, D., Gorkemli, B., Ozturk, C., & Karaboga, N. (2014). A comprehensive survey: artificial bee colony (ABC) algorithm and applications. Artificial Intelligence Review, 42(1), 21-57. Krishnan, A. (2016). Killer robots: legality and ethicality of autonomous weapons. Routledge. Lim, H. S. M., & Taeihagh, A. (2018). Autonomous Vehicles for Smart and Sustainable Cities: An In-Depth Exploration of Privacy and Cybersecurity Implications. Litman, T. (2017). Autonomous vehicle implementation predictions. Victoria, Canada: Victoria Transport Policy Institute. Marchant, G. E., & Lindor, R. A. (2012). The coming collision between autonomous vehicles and the liability system. Santa Clara L. Rev., 52, 1321. Makridakis, S. (2017). The forthcoming Artificial Intelligence (AI) revolution: Its impact on society and firms. Futures, 90, 46-60. Milakis, D., Van Arem, B., & Van Wee, B. (2017). Policy and society related implications of automated driving: A review of literature and directions for future research. Journal of Intelligent Transportation Systems, 21(4), 324-348. Osoba, O. A., & Welser IV, W. (2017). The Risks of Artificial Intelligence to Security and the Future of Work. Santa Monica, Calif.: RAND Corp, 7. Peters, M. A. (2017). Technological unemployment: Educating for the fourth industrial revolution, Educational Philosophy and Theory, 49:1, 1-6. Ramchurn, S. D., Vytelingum, P., Rogers, A., & Jennings, N. R. (2012). Putting the'smarts' into the smart grid: a grand challenge for artificial intelligence. Communications of the ACM, 55(4), 86-97. Russell, S., Dewey, D., & Tegmark, M. (2015). Research priorities for robust and beneficial artificial intelligence. Ai Magazine, 36(4), 105-114. Scherer, M. U. (2015). Regulating artificial intelligence systems: Risks, challenges, competencies, and strategies. Harv. JL & Tech., 29, 353. Simshaw, D., Terry, N., Hauser, K., & Cummings, M. L. (2015). Regulating healthcare robots: Maximizing opportunities while minimising risks. Rich. JL & Tech., 22, 1. Stephan, K. D., Michael, K., Michael, M. G., Jacob, L., & Anesta, E. P. (2012). Social implications of technology: The past, the present, and the future. Proceedings of the IEEE, 100(Special Centennial Issue), 1752-1781. Taeihagh, A., & Lim, H. S. M. (2018). Governing autonomous vehicles: emerging responses for safety, liability, privacy, cybersecurity, and industry risks. Transport Reviews, 1-26. Tsai, C. F., & Wu, J. W. (2008). Using neural network ensembles for bankruptcy prediction and credit scoring. Expert systems with applications, 34(4), 2639-2649. Platforms significantly increase the ease of interactions and transactions in society. In the public sector, platforms are a way to improve public service delivery and solve increasingly “wicked” problems that characterize societies today (Head 2008; Hautamäki & Oksanen 2018; Janssen & Estevez 2013; Layne & Lee 2001; Bertot et al. 2010). Aided with information technology, public agencies can derive insights from a critical mass of citizens through platforms and improve citizen participation, transparency, policy design, and political legitimacy (Prpić et al. 2015; Taeihagh 2017; Voorberg et al. 2015; Bason 2010; Needham 2008; Christensen et al. 2015). Platforms will transform public sector innovation, but how they are implemented and managed can introduce various risks. Platforms can diminish accountability, reduce job security for individuals, widen the digital divide and inequality, undermine privacy, and can be manipulated by crowds (Taeihagh 2017b; Loukis et al. 2017; Hautamäki & Oksanen 2018). Fragmentation among multiple platforms and the difficulty of attracting sufficient of citizen participation may also undermine platforms’ effectiveness (Hautamäki & Oksanen 2018; Janssen & Estevez 2013). Furthermore, countries without strong governance mechanisms and property rights to attract the required capital investments may face challenges in building platforms (Taeihagh 2017b). Currently, studies have yet to evaluate the extent to which platforms improve public service outcomes (Voorberg et al. 2015). More recently, governments have experimented with blockchain-enabled platforms in areas such as e-voting, digital identity and storing public records (Cheng et al. 2017; Swan 2015; Wolfond 2017; Hou 2017). Blockchain's distributed, open and immutable nature offers many benefits for governments, including greater transparency, reduced corruption, greater efficiency and increased citizen participation (Ølnes et al. 2017). However, governments need to mitigate blockchain’s emerging risks such as security vulnerabilities, privacy concerns, and conflicts resulting from governance challenges (Li et al. 2017; Trump et al. 2018; Mattila & Seppälä 2018). Also, more research into the organisational changes in the public sector to accommodate blockchain-enabled applications and platforms is required (Ølnes et al. 2017). · Theoretical, conceptual or empirical studies that evaluate the effects of IT-mediated platforms on public service delivery and analyse how these platform activities affect the perceived political legitimacy of governments. · Examining the different types of challenges and risks that arise from adoption/implementation of IT-mediated platforms for public service delivery and the governance strategies to address these risks. · Analysis of the roles of different actors in influencing policy outcomes through participation in platforms and at different stages of policy making. · Theoretical and conceptual analysis of how IT-mediated platforms contribute to policy learning to improve public service delivery. · Examining the different types of platform governance structures in blockchain, their risks and unintended consequences (e.g. coordination challenges), and the organisational, administrative and institutional changes in the public sector to accommodate blockchain-enabled platforms. I hope you will join us for a stimulating set of presentations at ICPP4. Bertot, J. C., Jaeger, P. T., & Grimes, J. M. (2010). Using ICTs to create a culture of transparency: E-government and social media as openness and anti-corruption tools for societies. Government information quarterly, 27(3), 264-271. Hautamäki, A., & Oksanen, K. (2018). Digital Platforms for Restructuring the Public Sector. In Collaborative Value Co-creation in the Platform Economy (pp. 91-108). Springer, Singapore. Head, B. W. (2008). Wicked problems in public policy. Public policy, 3(2), 101. Hou, H. (2017, July). The application of blockchain technology in E-government in China. In Computer Communication and Networks (ICCCN), 2017 26th International Conference on(pp. 1-4). IEEE. Janssen, M., & Estevez, E. (2013). Lean government and platform-based governance—Doing more with less. Government Information Quarterly, 30, S1-S8. Layne, K., & Lee, J. (2001). Developing fully functional E-government: A four-stage model. Government information quarterly, 18(2), 122-136. Li, X., Jiang, P., Chen, T., Luo, X., & Wen, Q. (2017). A survey on the security of blockchain systems. Future Generation Computer Systems. Mattila, J., & Seppälä, T. (2018). Distributed Governance in Multi-sided Platforms: A Conceptual Framework from Case: Bitcoin. In Collaborative Value Co-creation in the Platform Economy (pp. 183-205). Springer, Singapore. Needham, C. (2008). Realising the potential of co-production: negotiating improvements in public services. Social policy and society, 7(2), 221-231. Ølnes, S., Ubacht, J., & Janssen, M. (2017). Blockchain in government: Benefits and implications of distributed ledger technology for information sharing. Ølnes, S., & Jansen, A. (2017, September). Blockchain Technology as s Support Infrastructure in e-Government. In International Conference on Electronic Government (pp. 215-227). Springer, Cham. Prpić, J., Taeihagh, A., & Melton, J. (2015). The fundamentals of policy crowdsourcing. Policy & Internet, 7(3), 340-361. Swan, M. (2015). Blockchain: Blueprint for a new economy. Sebastopol, CA: O'Reilly. Trump, B. D., Wells, E., Trump, J., & Linkov, I. (2018). Cryptocurrency: Governance for what was meant to be ungovernable. Environment Systems and Decisions, 38(3), 426-430. Voorberg, W. H., Bekkers, V. J., & Tummers, L. G. (2015). A systematic review of co-creation and co-production: Embarking on the social innovation journey. Public Management Review, 17(9), 1333-1357. Wolfond, G. (2017). A Blockchain Ecosystem for Digital Identity: Improving Service Delivery in Canada’s Public and Private Sectors. Technology Innovation Management Review, 7(10). On behalf of the organizing committee, we are pleased to announce that the call for abstracts for the Third Annual Meeting of the Singapore-based Public Policy Network has been extended to December 1, 2018. Based on the model of similar successful public policy networks around the world, the Singapore PPN provides a venue for faculty at Singapore’s post-secondary institutions interested in topics of public policy or comparative politics to present their work and engage in discussions with colleagues from around the region. The 2019 workshop will be held on February 1, 2019 at the School of Social Sciences (SOSS) at Singapore Management University (SMU). Although based in Singapore, the workshop is open to papers on all topics within the policy sciences and also more broadly to comparative politics and is not restricted to only those directly related to Singapore. Proposals for papers may deal with any issue of interest to scholars looking at local, national and international events in the region and elsewhere, or with theoretical, conceptual or methodological subjects related generally to policy studies. Participants to the workshop are responsible for their travel to the event venue. We hope you will join us for a stimulating set of presentations in February, 2019. The recent proliferation of interest in policy design years has reignited interest in the analysis of policy tools. Not only are new tools and new tool hybrids such as nudging and co-production being (re)discovered and new areas of application of old tools being found, such as crowd-sourcing and co-design, but older tools are also being used in new contexts, such as advisory commissions and information provision. It is time to survey and compare these developments and (re)contextualize them within the existing literature on substantive and procedural policy instruments and policy design. 8. The relationship between tools and “platforms”: that is, specific kinds of ‘meta-tools’which are open-ended and multi-functional and provide the foundation for the use of other more directed tools. Proposals from all disciplines, approaches and perspectives are welcome, so long as they shed new light on critical aspects of policy tools. Novelty, creativity, and rigour will be the main criteria for selecting proposals.High quality papers will be selected for publication as a special issue in an international journal, to be identified after proposals have been reviewed. A limited number of travel grants to cover the cost of economy-class travel and accommodation will be provided. Please send proposals (500 words) along with authors’ names, institutional affiliations, Email, and list of relevant publications to IlJoo Park at policytool2019@gmail.com no later than November 30, 2018. Recent emerging technologies -- such as autonomous vehicles, autonomous weapon systems, blockchain technology, ridesharing, the Internet of Things – have triggered changes that are threatening existing markets, social and political orders. The heightened pace of these emerging technological innovations poses serious challenges to governments, which must cope with the disruptive speed and scope of the transformations occurring in many areas of social life. While these new technologies offer opportunities for improvements to economic efficiency and quality of life, they also generate many unexpected consequences and pose new forms of risks. 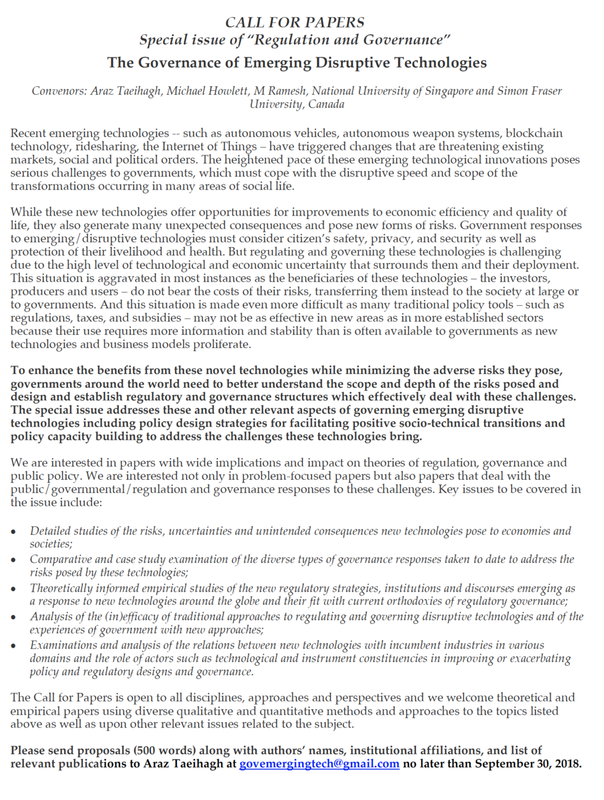 Government responses to emerging/disruptive technologies must consider citizen’s safety, privacy, and security as well as protection of their livelihood and health. But regulating and governing these technologies is challenging due to the high level of technological and economic uncertainty that surrounds them and their deployment. This situation is aggravated in most instances as the beneficiaries of these technologies – the investors, producers and users – do not bear the costs of their risks, transferring them instead to the society at large or to governments. And this situation is made even more difficult as many traditional policy tools – such as regulations, taxes, and subsidies – may not be as effective in new areas as in more established sectors because their use requires more information and stability than is often available to governments as new technologies and business models proliferate. To enhance the benefits from these novel technologies while minimizing the adverse risks they pose, governments around the world need to better understand the scope and depth of the risks posed and design and establish regulatory and governance structures which effectively deal with these challenges. The special issue addresses these and other relevant aspects of governing emerging disruptive technologies including policy design strategies for facilitating positive socio-technical transitions and policy capacity building to address the challenges these technologies bring. · Examinations and analysis of the relations between new technologies with incumbent industries in various domains and the role of actors such as technological and instrument constituencies in improving or exacerbating policy and regulatory designs and governance. The Call for Papers is open to all disciplines, approaches and perspectives and we welcome theoretical and empirical papers using diverse qualitative and quantitative methods and approaches to the topics listed above as well as upon other relevant issues related to the subject. Please send proposals (500 words) along with authors’ names, institutional affiliations, and list of relevant publications to Araz Taeihagh at govemergingtech@gmail.com no later than September 30, 2018. Call for Papers: Special Issue "The Governance of Sustainable Cities and Innovative Transport"
Around the world, much is expected of sustainable urbanization. The idea that comfortable life with all basic amenities and more, that also preserves the environment is simply too alluring to refuse. Concepts such as sustainable cities, eco cities, low carbon cities, intelligent cities, smart cities, resilient cities, knowledge cities and compact cities all respond to this hope, but they offer little more than fairly hazy perspectives. When it comes to urban mobility, this begs the question which modern and innovative options do smart sustainable cities offer for their integrated transport systems? How are they governed and organized, which solutions do they adopt in terms of their infrastructure and rolling stock? What promising technologies and information systems do they utilize now or are they proposing for their future and how do they deal with them? And finally, how truly sustainable, low carbon and ecologically friendly are they and will they be in the coming decades? It is these and similar questions which a new special issue of ‘Energies’ is aiming to address. An international team of three scholars, Martin de Jong (TU-Delft), Araz Taeihagh (Lee Kuan Yew School of Public Policy, National University of Singapore) and Rui Mu (Dalian University of Technology) invites their peers around the world to contribute high-quality articles on these pertinent topics. They will organize the issue around the urban governance of the following themes: (1) Urban and transport concepts and systems, (2) Innovative technologies and technical solutions, and (3) Innovative and sustainable structures and processes. Submitted manuscripts should not have been published previously, nor be under consideration for publication elsewhere (except conference proceedings papers). All manuscripts are thoroughly refereed through a single-blind peer-review process. A guide for authors and other relevant information for submission of manuscripts is available on the Instructions for Authors page. Energies is an international peer-reviewed open access monthly journal published by MDPI.